Have you seen the Western Maryland Regional Library's eNewsletter, The Wave? If you're a public library employee in Allegany, Garrett, or Washington counties then it is being delivered to your work's email inboxes! If you're not receiving it at work or would rather receive it at a personal email account, please let me (jzamostny@washcolibrary.org) know at which email address you'd prefer to receive The Wave. Why bother receiving and reading The Wave? Good question. Staff Spotlight: every issue our very talented Dennis McPherson interviews a staff member from one of the library systems. We rotate between WCFL, ACLS, RELIB, and WMRL. Who knows? You might be in the spotlight next! County Spotlight: similar to the staff spotlight, the county spotlight highlights what's new and exciting at the county level. We rotate this content as we do the staff spotlight. Who knows, maybe you'll find your next best idea by reading about what one of your colleagues has done just a couple hours away? Training Spotlight: Don't have time to read all of my workshop emails or to check the MERLIN calendar for training events? No problem. In every issue of The Wave there will be one upcoming training event highlighted complete with date, time, location, and registration information. Did You Know: This is still a fairly new feature but it seems to be popular so, we're going to keep it going for now. This is another video segment where staff from the Regional share interesting facts and updates at the local, state, and national levels. Stay tuned to see who might be hosting the next episode! What's new in the upcoming March/April issue (which will be coming to an inbox near you on Feb. 27th)? A contest which could win you a $20 gift certificate to a vendor of your choice! Plus more ... I wouldn't want to give it all away, now would I? I just heard back from Shepherd Springs and they say they do not have space large enough to accomodate 150 people. This was a very interesting presentation on technical services from an academic library perspective. Not surprisingly, the challenges facing academic libraries are the same ones public libraries are facing, including budget issues, changing user expectations, and staffing levels, and while the actual materials may vary from those in the public library (dissertation and thesis materials, serials, etc) the approach to these challenges are similar to those being taken by public libraries in Maryland. The discussion of the Demand Driven Acquisition (DDA) model caught my attention. I had first heard about this at the ALA conference last year, again in an academic environment. DDA allows users access to ebooks for a fee for the first few times the resource is needed. At some per-determined point (after so many accesses), the ebook is purchased (permanently). This makes so much sense to me, and I think there should be a way of applying it in the public library. Depending on whether our publishers would agree to this and the library being willing to “purchase” ebooks, it seems it could be applied to non-fiction and reference materials pretty easily. Of course, the other part of the equation in making this successful would be re-training users to the ebook world for their resources. I know this has started, but it is a very slow process. Especially in rural communities like Hancock. But I think it is an idea that needs to be considered and revisited often. The George's Creek Promotion Council, friends of the GC Regional Library reports at least 9 main people on their steering committee. Perhaps instead of inviting all friends, too many = too expensive, a representative can be invited to join us for the day... Update: I entered an incorrect number for GC. It should be 20. Info on the Friends of the LaVale Library: Pam Neder, branch librarian reported a total of 9 on the steering committee. I still need to get the info from our own library branch! Info so far I have received from Connie Workman, branch manager, on the Friends of the Frostburg Library: I know there are 5 persons that sit on the board of the Friends group. Jack Riley is the president. We actually send out over 400 letters to members each year. I am not sure how many respond but we gets lots of money. I could ask Judy Harden the secretary how many active members there are – she might know. The Riley’s are gone for the winter to Vegas. I think I can email them. I’ll let you know a total ASAP. Leadership Washington County's Literacy Day took place on Friday, Jan. 11, 2013. Below are some lingering questions, observations, and notes that came to me throughout the day. 83% of MD kindergarteners are "fully school ready" which means 17% are not. (Data from 2011-2012) Fully School Ready means that the kiddos consistently demonstrate the skills, behaviors, and abilities which are needed to meet kindergarten expectations successfully. 78% of Washington county's kindergarteners are "fully school ready." School readiness of low-income children rose from 38% in 2001/02 to 70% in 2011/12. According to 1992 data from RAND, 90% of a child's brain is developed by the time they're 5 years old but 90% of public spending (investing) in children's cognitive development occurs between age 5 - 18. The following phrases were mentioned and talked about during the day but I would have appreciate more details. What are the different levels of literacy? One of the very first observations I made on Friday was that it's clear that childhood literacy is not a one sided issue; it's more like a triangle. 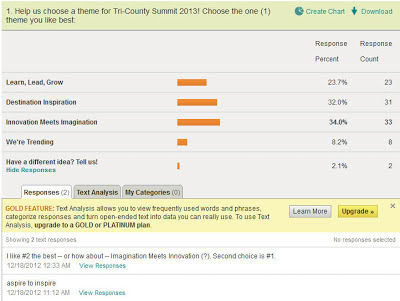 So, what I kept wondering throughout the day was, where are the stats on parent readiness and teacher readiness? There was a whole presentation and a half on school readiness - which focused on how prepared the kiddos are for school (kindergarten specifically) but there wasn't any assessment data shown that indicate how prepared teachers are to receive and help these kids develop; nor was there data to indicate how prepared parents are to help these kids develop. I realize that assessing parents in terms of kid readiness is probably a touchy subject but I still believe it's a valid question to be asking and one that needs to be asked if folks are serious about making headway on improving childhood illiteracy. Either that or we just need to accept that there will always be some form of illiteracy present in the world - which is closer to what I personally believe. On that note, another observation I made during the day is that there seems to be a negative connotation that comes along with being illiterate. And we wonder why folks who are illiterate aren't so quick to raise their hand and say, "yes, that's me, I can't read!" This makes me think that another area in need of improvement is to lessen the stigma associated with illiteracy and exercise some compassion when attempting to reach out to our neighbors whom the rest of us reading-folk label as "illiterate." I don't believe that the illiterate population is choosing not to learn how to read just to spite the rest of us so, why do we take it so personally? To really fan the flames on this discussion, might I point out several adults I know who have told me that they don't want to learn how to use a computer, email, cell phone, etc. Aren't they choosing to be technologically illiterate? Or how about the folks who, "only learn what they have to in order to do the bare minimum," in regards to computers? I'd say that sounds like a funcational technologically illiterate mindset, wouldn't you? The last observation I'll share with you is one that I tried to voice during the morning debrief but that I'm not sure I expressed myself clearly. Basically, I believe that literacy itself is changing. I'm not saying that how we are defining literacy is changing (even though we are or at least we're trying to) but that literacy is organically evolving into something else that we have no control over and that I believe we are not prepared for. For instance, the English language is evolving - in 2011 the Oxford English Dictionary added OMG, LOL, and FYI to its pages. So, when one of Friday's presenters told a story of how a student turned in a term paper written solely in text-speak I thought, "how creative!" But that obviously wasn't how the teacher received the paper. Now, I don't know what the topic was and I don't know what the criteria was for the paper so, I'm purely reacting based on how fun it must have been for that student to write that paper and I'm also thinking of different contexts when I would think that writing in text-speak would be completely appropriate and creative (creative writing course, communications course, etc). Literacy is based on language, right? So, if d language is changing (evolving) is it fair 4 us 2 say that individuals who write n text-speak (aka use an expanded vocabulary) r not enhancing their literacy bt degrading it? I dsagre. D mor waz we knw h2 comnc8, d btr - IMHO. Tru, contxt plays a big pt n der r vry wel tyms wen text-speak prolly isn't suitable accrdng 2 societal norms bt I bleev that will chng n tym. If you consider yourself text-speak illiterate, that's ok! Join the crowd. There are free tools to help you such as Lingo2Word. To tie in one last point with my "text-speak is helping the English language to evolve" argument, I'd like to say that this isn't the first time the language has adopted abbreviated version of its vernacular. Just look at the differences between British English and American English. We dropped Her Majesty's u's in behaviour, saviour, paviour, and favour, etc. We also dropped the s in towards, forwards, and rightwards. American English also shortened British phrases like skimmed milk (we say skim milk), dolls' house (we say dollhouse); barber's shop (we say barbershop). Hmm, something just occurred to me. Maybe text-speak is the next version of Pidgin English?! See, if we pay attention we can experience the creation of a new language. How often does that happen? All we have to do is open our minds to the experience and incorporate it into what we already know about teaching language and literacy. Is your facility available on Nov. 11, 2013? Can your facility accommodate 150 people? Including bathrooms (mostly women) and parking? Our largest conference area can seat 200 people. There is a restroom in the conference area as well as others in a nearby area if needed during breaks. Parking is not an issue. What types of meeting spaces do you have? Are they flexible – can accommodate all 150 but also small groups of 40? How many rooms are available? I have attached a conference room description sheet for you. This will give you a general idea of the size and the number of people they can hold. What type of dining options are available on site? Both in terms of actual food/beverage but also seating/eating. We have a 100 person restaurant that serves 3 meals a day. We can also cater coffee breaks and lunches, and picnics. Does your facility have wifi access? Hardwired internet access? The room fees are $50 per room for 3 hours and a Sexton fee may be assessed at $50.00 for a 3 hour period of time. As for food, we would have to cater it, probably through Bagelicious or Leiters or you would be free to contract a caterer of your own choosing. Dining would be in our Fellowship Hall. If the 150 is a sure thing, we would most likely need to put your group in the Sanctuary (can hold over 300) for the plenary. If it is a "no more than" figure we could use the Auditorium which would be more comfortable (separate chairs instead of pews). We have 2 rooms that can accommodate breakout sessions of 40+ people and the Auditorium if it is not used for the plenary session. All the rooms upstairs are hard wired with internet access. We do have Wi-fi and we can give you that password upon arrival. 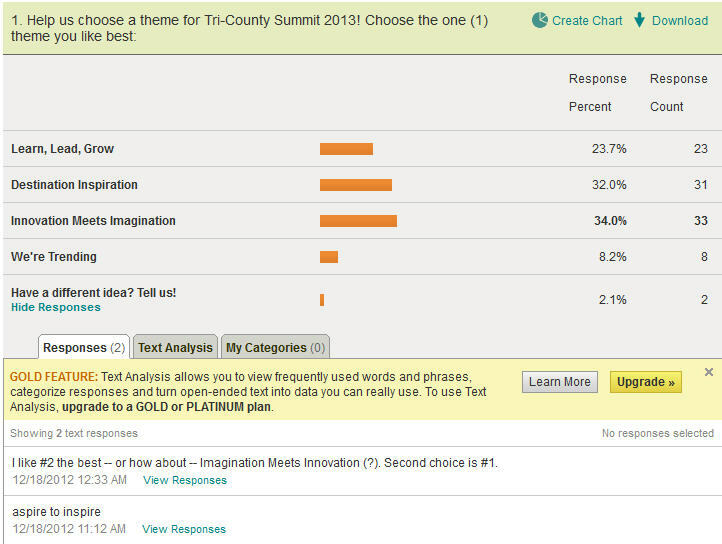 Results of the Summit 2013 Theme survey are in, and it's Innovation Meets Imagination by a nose! This program was about how to build, and maintain, coalitions made up of community organizations to further the agendas of your own organization. One of the problems that libraries face is that they’re not at the table when decisions are made. There is frequently an uneven distribution of power and influence at the table when budget considerations are made. Decision makers don't realize that the library is a de facto social services provider. The key to a successful community coalition is to align your interests, and make yourself relevant, to what other people are doing. Make them fight for you while they're fighting for them. Once a year, you should get everyone together and ask, "What does our community need?" Throw all the ideas up on a white board and then whittle them down to 3 or 4 items. Hire a lobbyist in Annapolis and point out to the legislators that everyone in the coalition is singing the same song. Make sure that success is measurable - not "improve literacy" but "build a new library building." When you ask for money, you get advice. When you ask for advice, you get money. If you're at the table with the coalition, you are perceived as being part of the community instead of being perceived as unimportant and all on your own. How I can use what I learned in my role at the library: This will help when I ask my homeschool group to help with library advocacy - particularly at funding time.